It’s a popular joke, wherein a doctor restores the clarity of a patient’s vision by simply cleaning their glasses. Those who wear eyeglasses might possibly have been at the receiving end of this joke at one time or another. For most, it’s very hard to resist the urge to reach for your shirttails to clean your lenses. But the fine dirt particles in your shirttail are enough to scratch the lenses of your glasses, not to mention that this habit is very unhygienic for your eyes. Be informed that according to experts, no lens is truly scratch-proof. Eyeglasses easily get dirty, and hence require regular cleaning. How to clean eyeglasses correctly and safely is a question that baffles young and old alike. Whether you’ve recently started wearing eyeglasses or you’ve been wearing them for a couple of decades, you might not have been cleaning them the right way. So, here is a small video to simplify the procedure for you. Another mistake that people often make is using window cleaner and other such products on their eyeglasses. You must understand that there’s a difference between window glass and corrective lenses. 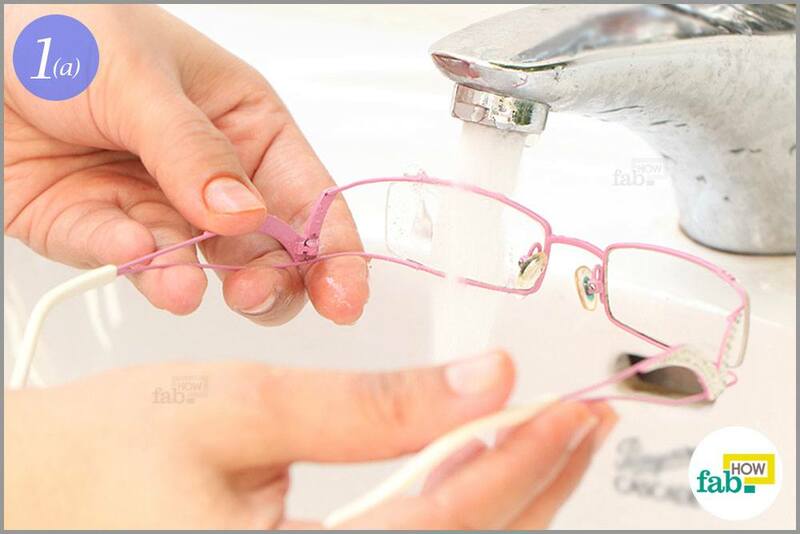 Maintaining proper hygiene of your eyeglasses and other eyewear is very important for the health of your eyes. And the good news is that it’s not that difficult. Here you can learn in easy steps, not only the correct way to deal with the lenses, but also how to clean eyeglasses the correct and safe way without cleaner. It’s important to wet the lenses before cleaning them. Simply move the length of the lenses back and forth under running water from a tap. This will also help remove any loose dirt or debris. Be careful about the temperature of the water. While hot water cleans better, it might ruin your lenses – plastic or otherwise. Definitely not worth it! You can clean the lenses just as effectively using lukewarm water. Squirt a small drop of mild liquid hand soap on each lens. If you don’t have liquid hand soap, you can use any mild liquid soap that doesn’t contain ammonia, like a baby wash or dishwashing liquid. Ammonia is not good for the coating on the lenses. Grasp the lens delicately between your thumb and forefinger. Rub in circular motions or “note-counting” motion to spread the soap thoroughly over the lens. Experts say that mild soap and water is the best way to wash the accumulated oil and dirt off your lenses. 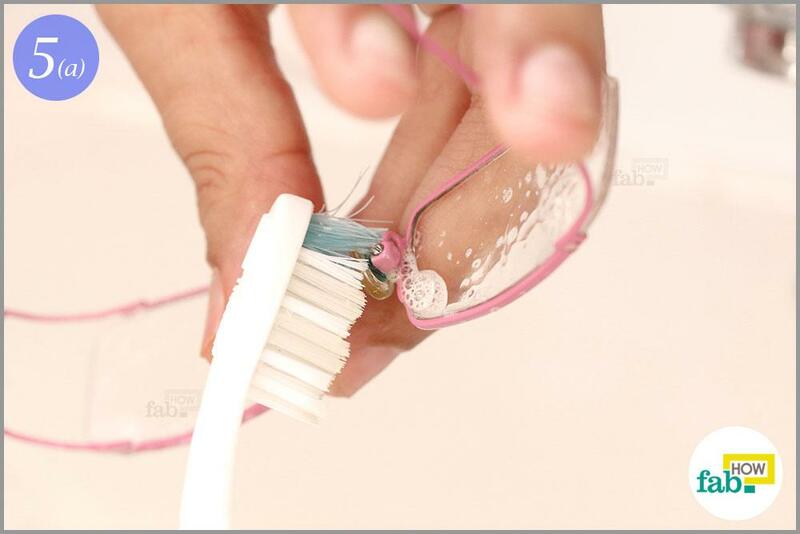 Use an old toothbrush to clean the frame of your glasses. Make sure that you don’t use a dirty toothbrush, as eyeglasses and other eyewear should be cleaned in the most hygienic way possible. Clean the temples and earpieces of your glasses with the toothbrush, taking care to reach into the nooks and crannies that harbor grime. 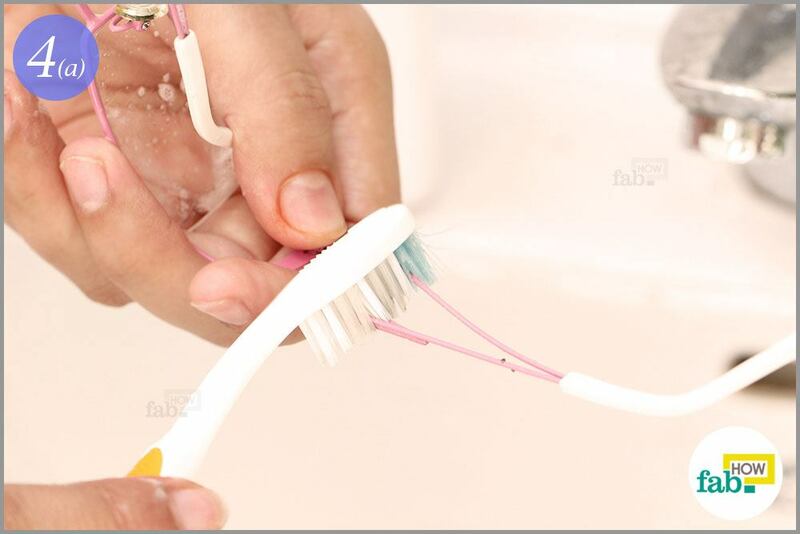 With a steady hand, clean the nose pads with the toothbrush. Be careful not to scratch the lenses with the toothbrush. 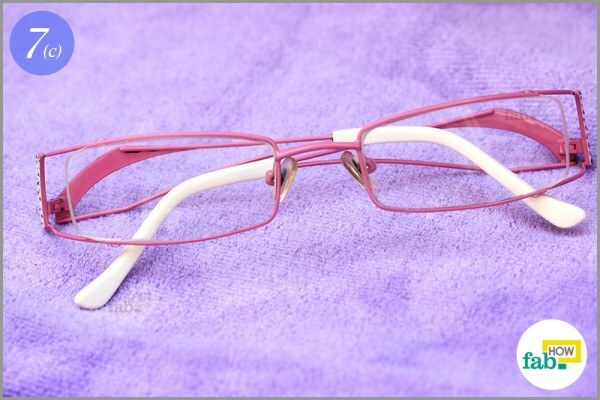 In many eyeglasses, the nose pads can be removed. 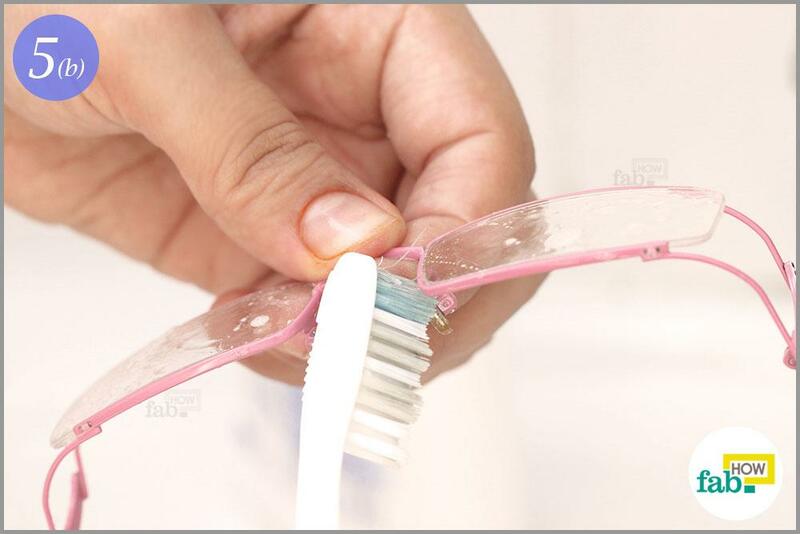 You can take them off to better clean the nose pad plate with the toothbrush. However, this should only be done every 3 to 4 months, as taking the nose pads off too often will render them loose and prone to falling off. 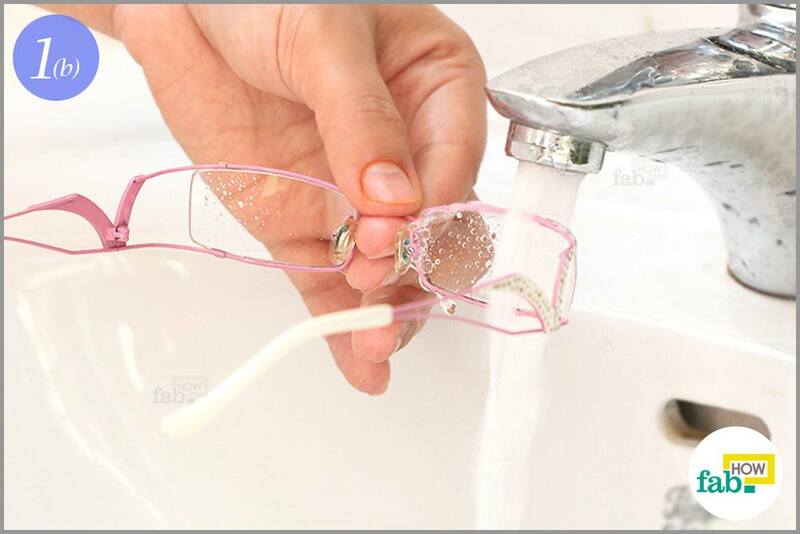 Once you’re done cleaning your eyeglasses, rinse them off under a running tap. Again, take care to move the length of the lenses under the water stream in a back-and-forth motion. 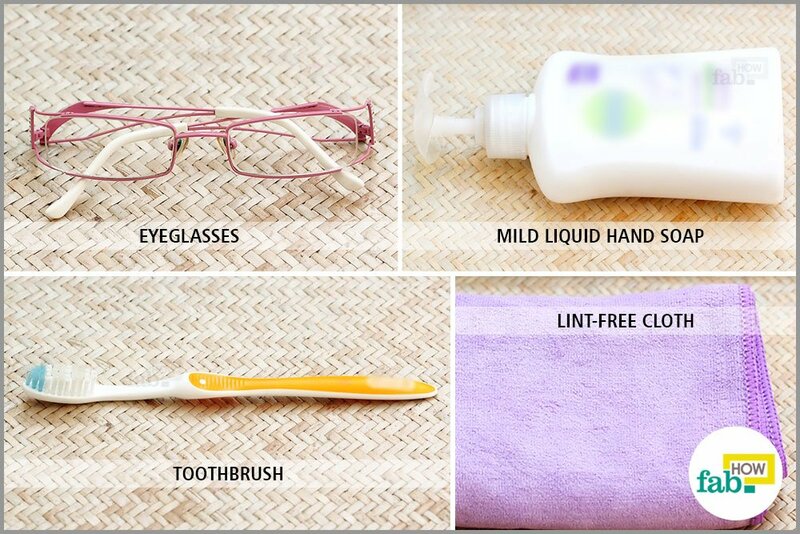 Use a clean and dry lint-free cloth to wipe your eyeglasses dry. Use circular motions to gently dry the lenses. 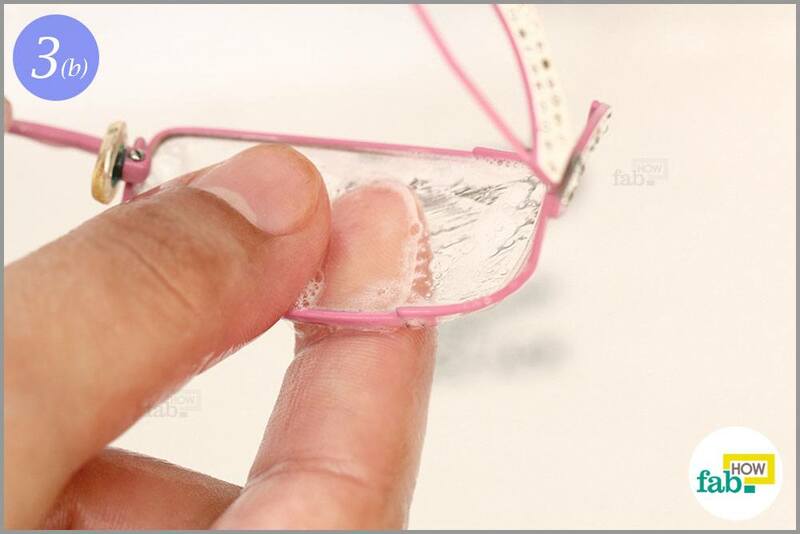 Hold the bridge of the glasses between your thumb and forefinger when drying the temples. 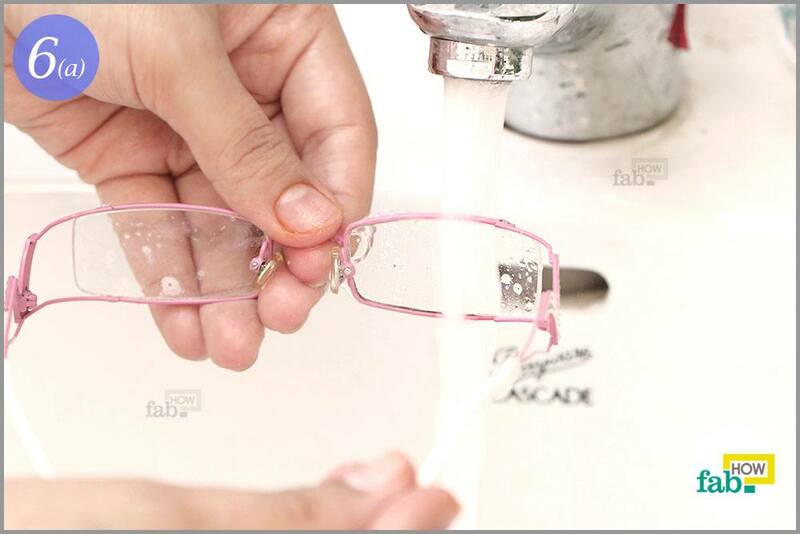 Develop the habit of washing your glasses daily with plain water when you wash your face or take a shower. A thorough cleaning as described above can be done once a month. With your properly cleaned glasses, you’ll now be able to see the world with new clarity! Your cleaning agent or liquid soap must be ammonia-free. Ammonia attacks various protective coatings of the lenses in your glasses, making them wear off. 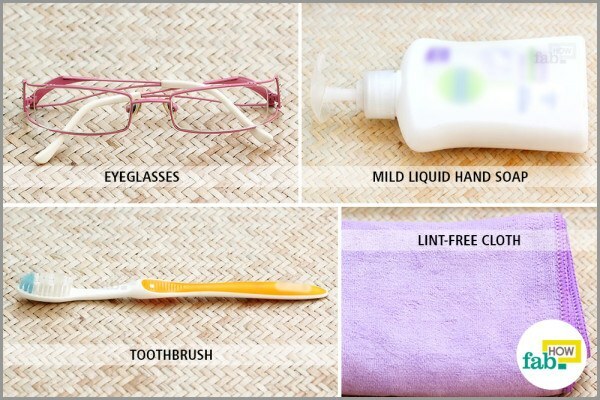 Do not use citric-based detergents or soaps to clean your eyeglasses. Never clean your lenses with bleach, vinegar or window cleaner. Just like ammonia, these can break down the protective coatings. 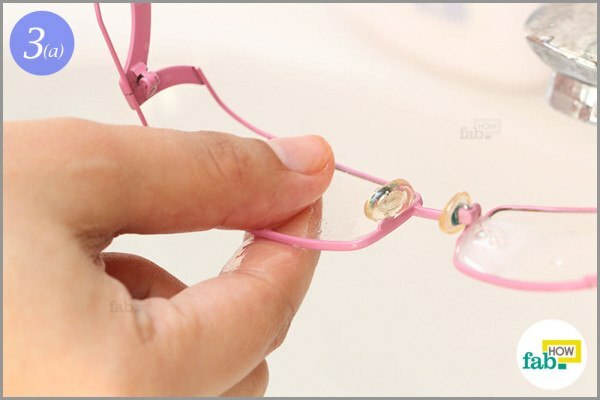 Avoid cleaning the lenses when they’re dry, as the dirt particles might scratch the surface. Use a soft, lint-free cloth to dry your glasses. Any rough cloth could scratch your lenses. 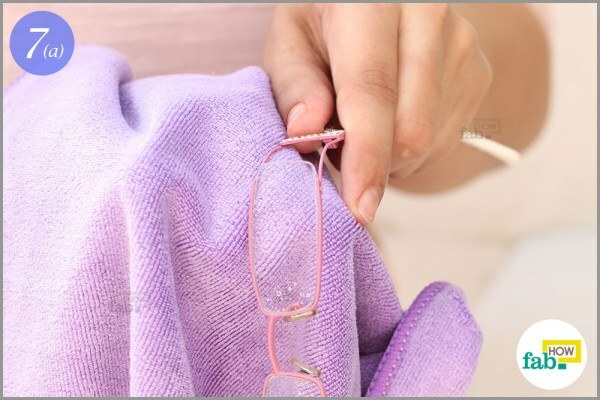 If you can’t get your hands on a lint-free cloth, you can use the lens cloth that comes with your eyeglass case. Be sure that the stream of water is always parallel to the lenses while washing the glasses, as the lenses are not made to withstand water pressure. Be cautioned that a steady stream of water may put undue pressure on your lenses, which might ruin them eventually. Avoid laying your glasses down on the surface of the lenses, as this might scratch as well as dirty them. 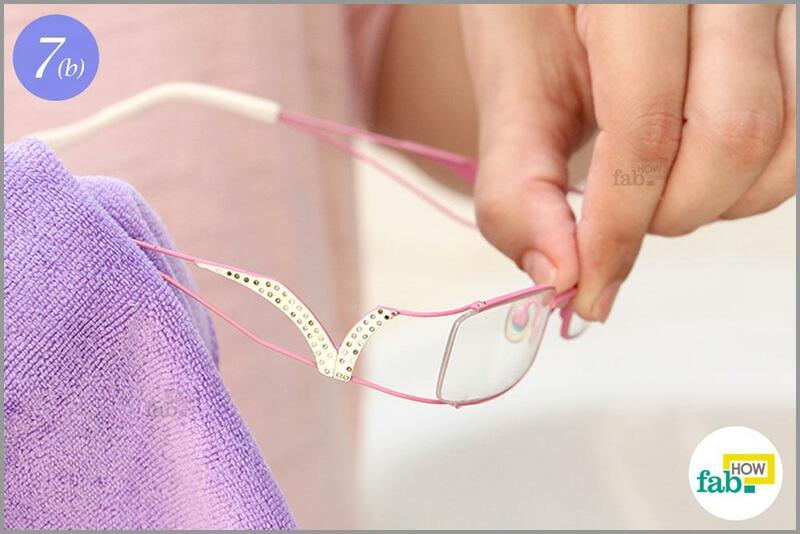 Refrain from touching the lenses of the glasses when not cleaning them. This leaves unpleasant fingerprints on your lenses. Always use both hands to take your glasses off and put them on. This helps the frame of your glasses retain its shape. I’ve been wearing glasses for almost 16 years and I’d never thought of trying to clean them without cleaner. I’ve often found myself dealing with dirty lenses or frames because I wasn’t aware of a way to clean them, and now I have a way to make sure they’re always clean! I can’t thank you enough for sharing this. I’m excited to try and clean my glasses on my own now. Tobias, Thank you for your positive response. 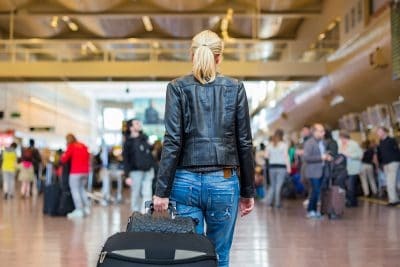 We promise to keep making your life easier by our simple hacks and tips.